It starts with the letter S and ends with aturday. No alarms are set, I have nothing on the agenda. No work to do, no rush hour to plan for, no excel files to update. No one telling me about TPS reports or PC Load Letters. I get out of bed when I feel like it and mosey on over to my reading chair, pull out a new magazine or the iPad, pour a cup of coffee and snuggle up with the pups while College Gameday whispers sweet nothings in the background. Late October is the perfect time of year, before you really need to crank that heat on in the apartment. 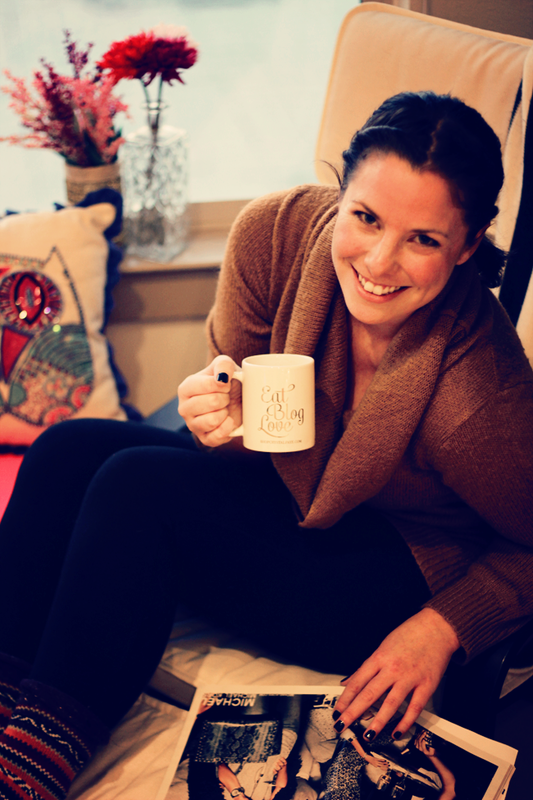 When you can layer yourself in plaid button ups and cable knit sweaters, fuzzy socks pulled up over leggings, fill an adorable coffee cup to the brim and wrap your hands around the cup to keep cozy. I have really enjoyed drinking Georgia Coffee recently, because they have both light and dark roast, as well as decaf, and is made with 100% Arabica Beans. I use dark roast when I want to ice my coffee, light roast when I drink it hot. I splash some non-fat milk in there and I'm all set for a relaxing morning of watching Lee Corso make a fool of himself dressing up as the mascot du jour. Who is ready for another cup... and another hour of InStyle and College Gameday? What is your favorite coffee moment? Leave a comment or join in on twitter! These pictures of you are FANTASTIC!!! You look so cute and cozy! Saturday mornings watching Gameday are my favorite too! That picture of you and the puppy dog in your lap....TOO CUTE! I want that mug...like now! I love it. And you are looking quite lovely, lady! I love coffee on Saurdays when its chilly and I'm snuggled up with a good book. Or college gameday... that's pretty perfect too. I feel like I actually get to enjoy my coffee on Saturdays, instead of gulping it down like I do on weekdays. these pictures are adorable. you looks so cozy that it makes me want to join you. also, I need that mug! These are the SWEETEST pictures! PS - GO VOLS! Haha I always love seeing you with that mug. Some how, I feel like these are lies and you really don't change out of your pajamas. At least I don't, don't tell me I'm alone. I love when I can just sit and enjoy coffee and not do anything else, not feel rushed, just sit at home and watch some good ol fashion reality TV. And these pics are amazing. 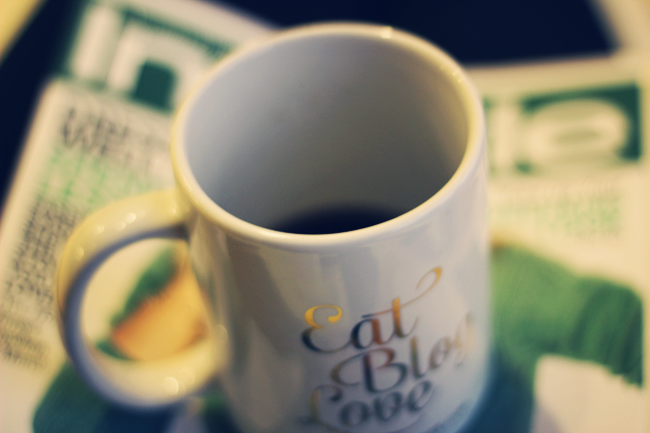 Nothing makes me happier than a cup of coffee and a lazy Saturday morning! I wish we could have more Saturdays in our lives! can i has your socks?! i love the office space reference! 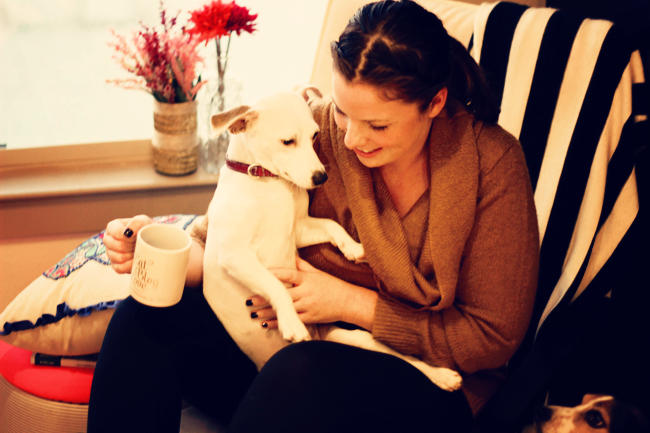 love enjoying coffee on the weekends though my dogs usually jump on our laps and spill coffee too. love the photo with venus in your lap and general looking all jealous in the corner. you are just the cutest! great pic of you holding your mug of coffee and looking at the cam. That's what you look like when you're at home?! You're perfect. Looks like the perfect morning. :) And I love that mug! Did you take these photos with your fancy new camera? They look good! 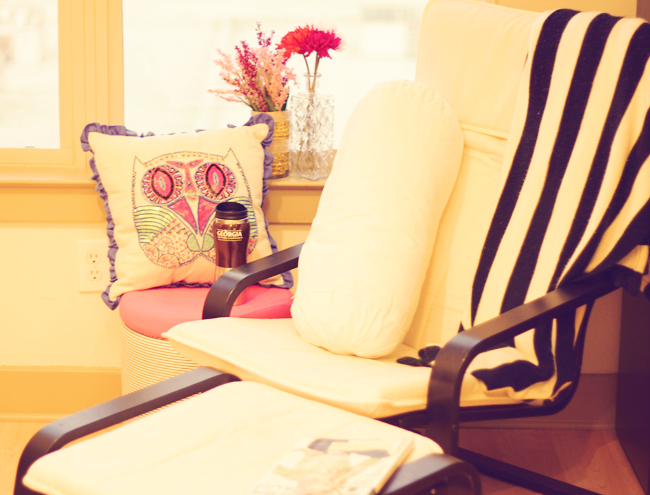 So in love with the owl pillow! That coffee cup is such the best. Pretty sure that college football and cozy sweaters are what make the PERFECT Saturday too. And a cuddle buddy. I love that cup!! ANd you look amazing!! Love that sweater.. I so need a reading chair. 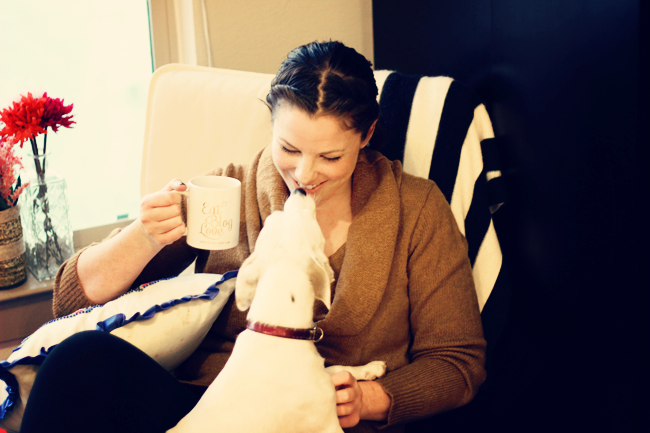 Coffee with the pups - a perfect morning! That sweater looks oh so cozy! Also, where did you get the mug? I love it! I can't remember the last time I got to have a Saturday morning like that. I'm more than a little jealous.